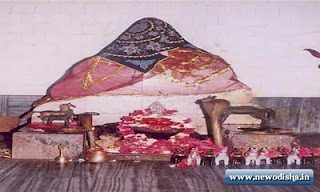 Maa Gojabayani temple is one of the most famous for goddess Maa Gojabayani of the District Kendrapara, Odisha. It is situated about 15Kms distance on road from the main town Kendrapara. Maa Gojabayani temple is one of the most trusted amoung the localities and by the people of the District Kendrapara. Ok now, if you remembered what happened before 9-10 years, Maa Gojabayani suddenly come into the picture as some people see the Godess live there and it is heard that all wishes come true for the devotees. Since then so many people visit there and pray the Godess and one move call Maa Gojabayani also released all over Orisaa which made a good business due to the trust on this Godess. When people visit there they can offer Fish or meat to the godess first then they can have a picnic there and have food. One more thing is If anyone doing picnic there and you go and sit there for food, as per the rules of the temple they have to offer you food. By Railway- nearest railway staion is Dhanmandal and Cuttack. By Road- The temple is 15 Km far from Kendrapara well accesible by Cars and Jepeps. By Air- Nearest Airport is Bhubaneswar which is 100 Km away. Give Responses for "Maa Gojabayani Temple of Kendrapara"